Hi-Lo 13 is a special side bet that can be offered with any kind of real money blackjack game. The aim is to correctly guess whether your initial hand will total more than 13, less than 13, or exactly 13, with each result offering its own fixed payout. This enables you to rack up big profits in no time, and to walk away with something even when you lose the hand. As with all blackjack sidebets, however, there is a catch – so read on to find out all the facts and figures before you hit the Hi/Lo 13 tables. The Hi-Lo 13 side bet is completely independent of your main blackjack wagers. This means you can lose the hand but still win the high-low bet, and vice versa. Neither result has any effect on the other. Click here for more information on blackjack side bets. To wager on any of these outcomes, you must place your betting chips in the appropriate betting box at the start of the round – i.e. before the deal, as with any standard blackjack wager. The high/low bet is paid out as soon as your first two cards are dealt. There are no soft hands when it comes to the Hi-Lo 13 wager, as all Aces count as one point for the purpose of the side bet. For example: if we wagered that our hand would be over 13 and we drew A + 3, we could not play it as 14 and thus would lose with a hard total of four points. Remember, this rule only applies to the side bet. Once that outcome is decided, normal conditions resume and Aces can count as either one or 11 points, as per usual. Side bets in 21 are notorious for promising much but delivering only disappointment, and real money Hi-Lo 13 games are no different. Even the most statistically sound wager on offer – over 13 – hikes up the casino’s mathematical advantage by well over 6.5 per cent. If you are located outside of Australia, like 21 sidebets and want to try your hand at Hi Lo 13, the easiest way is to play online at Royal Vegas – our #1 Internet blackjack casino for international players. 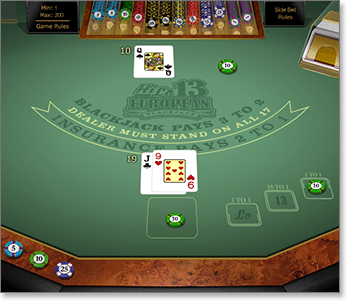 Here, among dozens of other interactive BJ titles, you will find Hi-Lo 13 European Blackjack Gold. This far and away the most prominent version of the high-low betting format, as part of the flagship Gold Series by Microgaming – the industry leader in Web casino software. And as with all of the Microgaming Gold Series casino games, the gameplay quality is smooth as silk and the graphics are second to none. Meanwhile, a betting limit of $200 per hand caters for all types of blackjack players, and a house edge of around 0.40 per cent makes it good value – bearing in mind the extra risk that comes with taking the side bets, of course.